After climbing Mt. Kilimanjaro with IMG in 2014, Mt Rainier was still on my bucket list. This year I got to cross it off the list (thanks to my lovely wife for letting me take a few days away!) 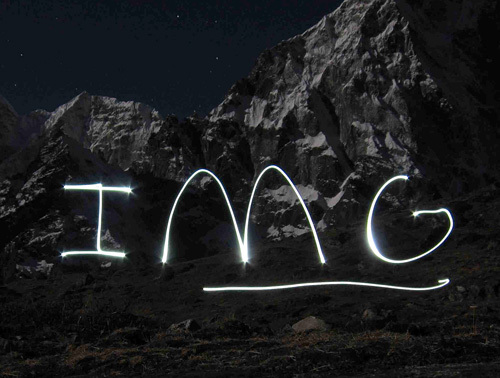 and experience once again the amazing support of IMG in reaching another summit. Thanks IMG! We reached the summit (14,411') at about 6:15am on August 15, 2017 after departing from Ingraham Flats (11,000') around 12:15am. The full climb was three days plus an afternoon gear pre-check the day before the climb. Summit "day" wake up call was at 10:45pm and despite being a bit tired, we were in good spirits and back at the Paradise parking lot around 4pm. 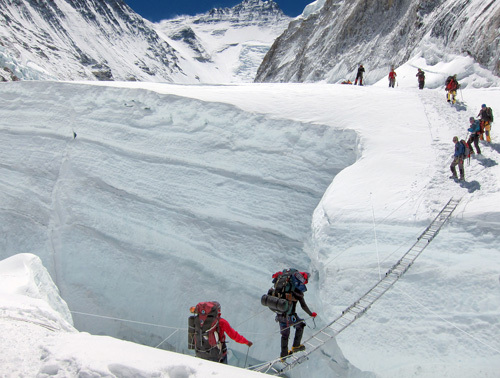 We witnessed unbelievably hard work on the part of our guide team. On Saturday morning, our planned summit route became impassable due to changes in the mountain terrain. IMG, along with the other guide services on the mountain, worked double shifts to get the route reopened. 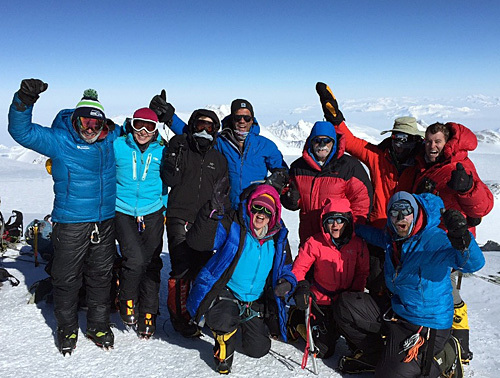 As a result, ours was the first and only team to summit the mountain on August 15. It was an amazing experience. As always, I learned a lot and felt lucky to climb with such a great group of climbers and guides. Saturday afternoon  We spent the afternoon going through clothes, talking about gear, and getting to know our fellow climbers. 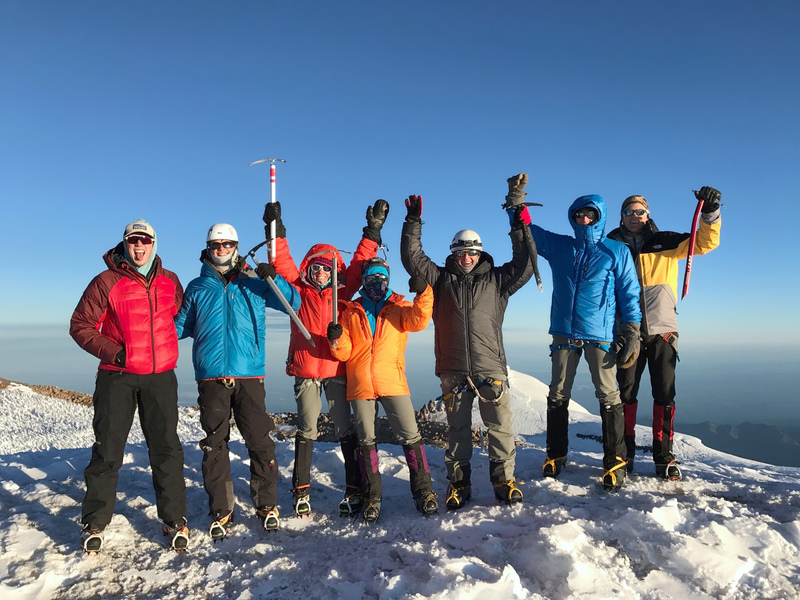 Our group consisted of eight clients: two friends from Wisconsin and SoCal  Tobin and Scott; Patty (who would complete her third Rainier summit on our trip) and two of her kids, Brandon and Tanner, and a friend of theirs, Wendy, all from Seattle; another David, from Colorado; and me. IMG did a great job getting us to take a bunch of stuff out. There's a lot of gear you don't need to bring up Mt Rainier! We also rented gear we did need. For some it's a chance to try out gear they don't currently own. Others find themselves frustrated when they realize they have a jacket "like that one" back home but didn't bring it and have to rent it. The good news is that most of the essentials are available for rent. Saturday evening  I picked up some extra food. I stayed at Alexander's Lodge, a few miles down the road from IMG headquarters. It met my needs and I got a great night of sleep. IMG has tents available for rent with cots in them, which looked good, but I wanted to make sure I had a real bed so I would have the best chance at sleeping well before the climb. 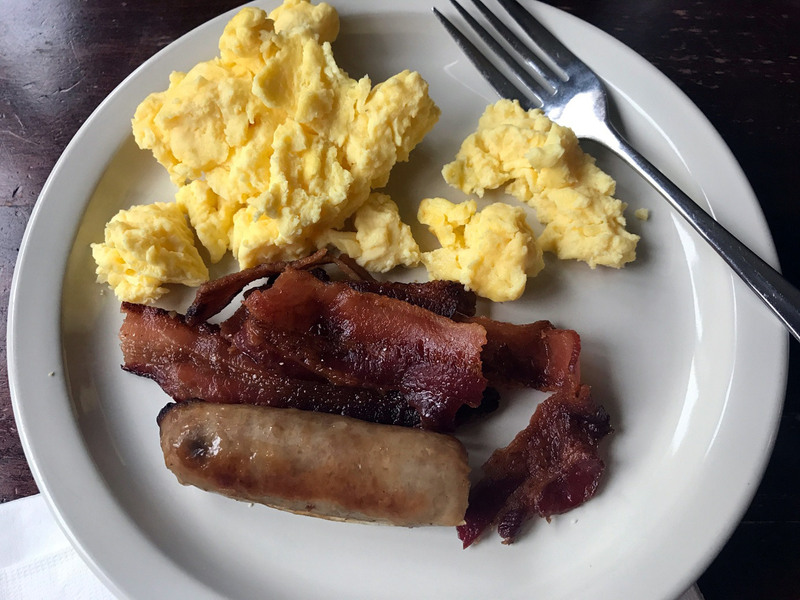 Alexander's also had a hot breakfast, so that was one less thing I had to think about the morning of the climb. 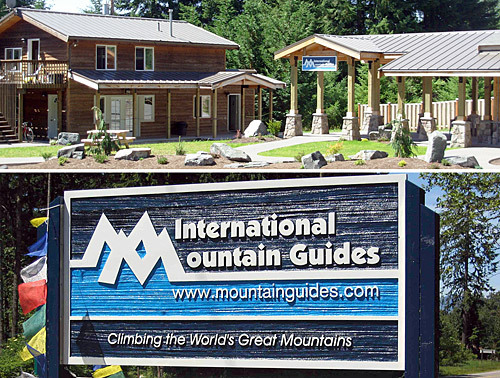 Sunday morning  Our group of eight met up with our four guides, Kim, Josh, Mike and Sara at IMG HQ. They packed our gear into a trailer behind the van and we drove up the road to Paradise, where the climb began. The weather had shifted from the beautiful, sunny summer day the day before to a cold, grey drizzle. Our guides said there had been an unusually long number of days (more than 50 of them) of sun in a row and this was the very first rainy day. We started out from the parking lot fully geared up, plastic climbing boots on. But it was still very warm  I was down to a t-shirt pulling into the first rest stop. 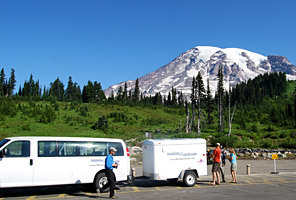 On the way up from Paradise to Camp Muir, we had four rest breaks. We kept up a good pace, but never felt rushed. I liked that the guides were focused yet laid back and good humored. 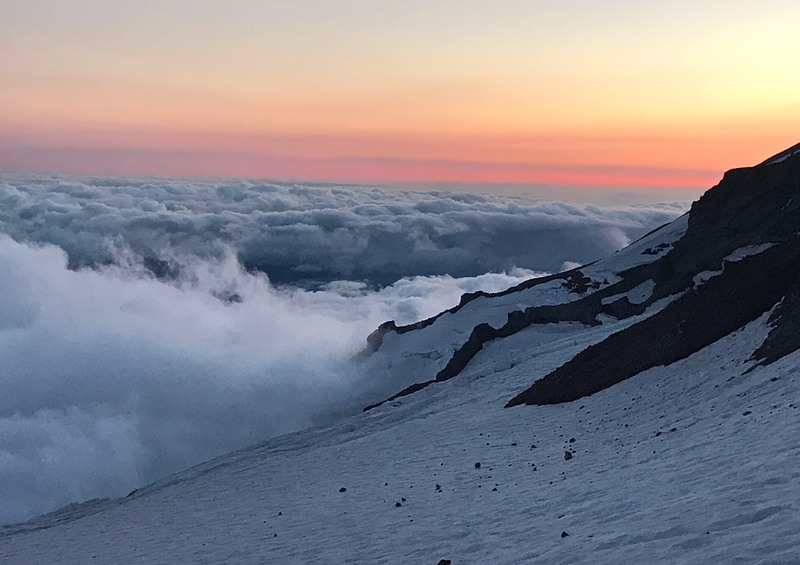 The time moved by quickly, and before we knew it (4-5 hours) we were pulling into Camp Muir at 10,188'. 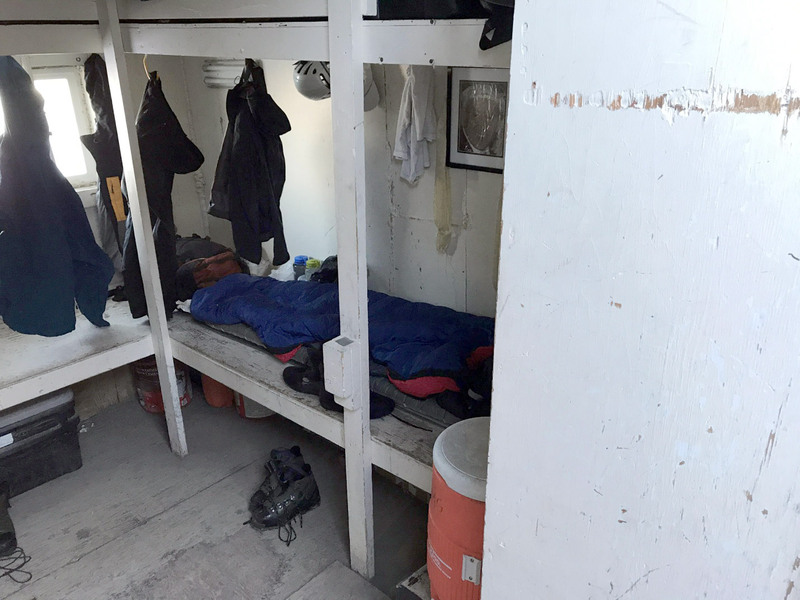 There are two bunk rooms for guiding company clients, one on either side of a wall, with separate entrances. The room we were in had a good amount of space for the eight of us, four people on each level. We had some time before dinner to get some rest. I lay down inside my sleeping bag ready for a nap. But first I checked the cell signal. Success! I had two bars and was doing email and texting my wife the good news and some photos  the weather was looking great. There were clouds down below but the upper mountain and the sky were totally clear. 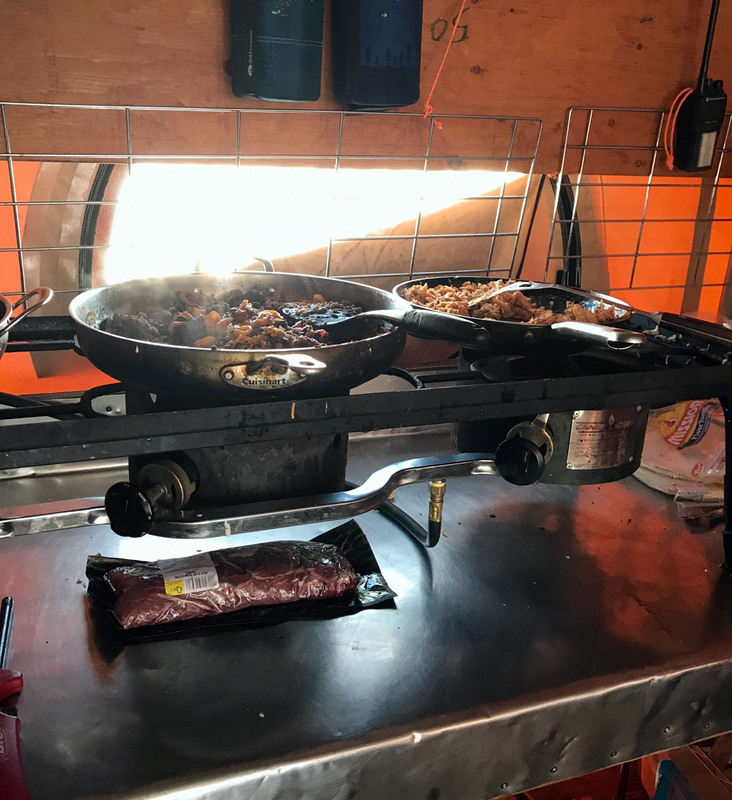 Sunday evening  Our guides prepared dinner in the Weather Port  which is down and up a small trail. Burritos. They were delicious. Note: If they offer you a burrito for the next day's lunch, think twice about it! Granted, the burritos are delicious, but everyone who took them up on it, including myself, didn't end up eating them. We just didn't have that kind of appetite further up the mountain. But it did make for some good humor. The next day, when Mike came back into camp after a long day getting the upper trail in shape for our summit bid, we couldn't help ourselves. "Hey Mike, how about a burrito?" Not missing a beat, of course, Mike responded with: "You got one?" After dinner, we saw the sunset, and it was amazing. Clouds below, clear sky above. Monday morning  We awoke to more good weather. Stepping outside the hut, I overheard some climbers talking. No groups had summited the night before. The route was impassable. I searched the web. There it was. The aptly named Disappointment Cleaver (DC) route was closed. Now here's where things got interesting. 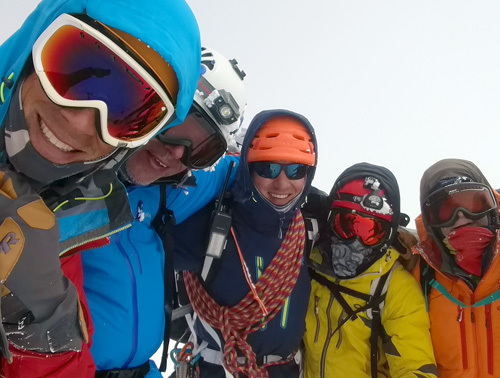 You have a group of people who have never met before until this climb, a small window of time in which to attempt the summit, altitude, weather, and a whole bunch of other variables. And then you have an impassable route. It's not a "get yourself ready for some really bad conditions up there" situation. It's a "you can make it all the way to 13,599' and then there's a big hole in the ground that you can't get over" situation. We all have different coping mechanisms in that kind of situation. Some people ask for more information from the guides. Some look for alternatives  how else can they spend the time they've invested? Some resign themselves to the fact that it's not going to happen. Some keep it in inside and don't say anything. But in the end there was not much more to do than focus on our training, get ready and prepare to keep moving up the mountain. From one moment to the next the situation was changing. Other guides were looking for potential routes, high up on the mountain. But they needed time. They would have to find a passable route, and then, even if they found that route, they'd have to clear it and try it themselves to make sure it was good to go. That was a lot to get done before our time ran out. The Mt. 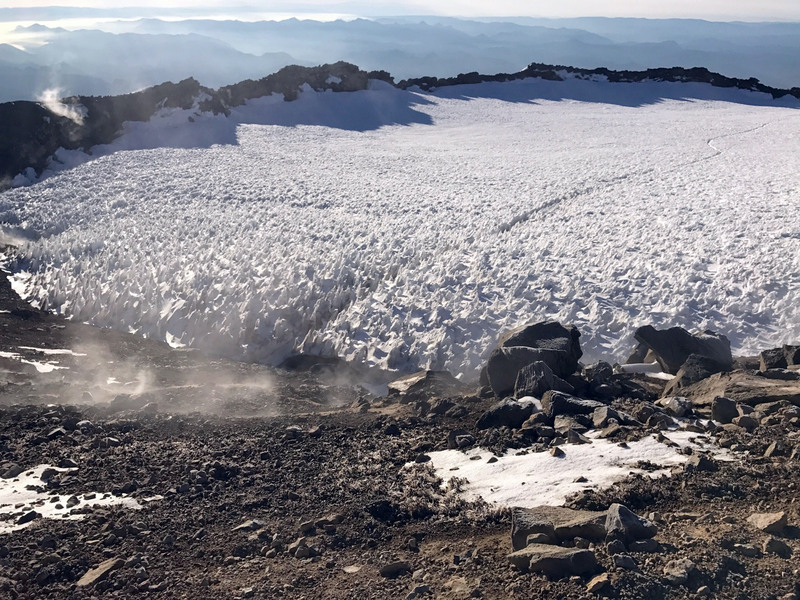 Rainier climbing blog did not sound promising: "Climbers will be looking for alternate routes around the crevasse in the coming days, but nothing obvious has presented itself." Monday mid-morning  Jason, an IMG guide who had been climbing the mountain for decades was up at Camp Muir. He took a break from coordinating the route-finding options across the various guide companies on the mountain to teach our crampon class. He made it fun and interesting. Later we would learn that he was supposed to head back down to Ashford but stayed up on the mountain to help with the situation. It's hard to imagine you can learn something and practice it for a few hours one day and then, exactly when you need it, you can use that skill the very next day, while you're exhausted. Jason had a couple of great sayings that really stuck with me. One was, "find the right tool and then figure out how much force to apply." Another was: "If one tool isn't working, try another." Example: If warm, fresh snow is sticking to the bottom of your crampons while you're descending and you're sliding off the trail with every step, try knocking that crampon with your ice ax. Not working? Apply more force. Still not working? Don't force it. Try another tool, like tapping the back of one boot against the front of the other, without breaking stride. Sunday, mid-day  After crampon class, we worked on self-arrest techniques  that is, how to stop ourselves from sliding down the hill in case of a fall. Then, boots on, crampons attached, we headed up the trail. That situation I mentioned? Still in flux and not looking good. Sunday afternoon  We headed up a bunch of snow and rock between Camp Muir and Ingraham Flats, which would be our home for the night. That was our first taste of crampons scraping against rock. It's like chalk on a chalkboard, only you're doing it voluntarily. We learned pretty quickly to look for the dirt  both to avoid the scraping noise and to get better footing. Interestingly, crampons aren't bad on rock and dirt, once you get used to them. Heading up the trail, it was hot, with sun beating down from above and reflecting from the snow below at the same time. Ten minutes in I was soaked  see my note on gear choices below. At Ingraham Flats (11,000') our tents were already setup. We got settled into our new quarters and then the guides held our summit meeting. Sunday, 3:30pm  We got some cautiously optimistic news. Radio signals were not great, but one of our guides had heard that some guides had found a route that might work, and everyone was up high on the hill working on it. We got the summit talk, although I have to admit I didn't remember most of it. There would be rope teams. There would be a summit. We needed to be prepared, and our wake-up call could come at 10pm, but it could also come at 6am. There was simply no way of knowing for sure but our best bet was to eat, get packed, and try to get some rest. For the first time in a while it occurred to me that we might be able to go for the summit. Dinner was great: rice with meat and broccoli. There is nothing quite like real, fresh veggies high up on a mountain. Back at the tent, I couldn't sleep. I listened to some music and then realized I could get some phone signal. I texted my wife, letting her know that we might be able to go for the summit. I lay there for a while listening to the snores of my fellow climbers, but sleep was out of reach. I waited. Monday 10:45pm  The wake-up call came. Rise and shine! Well, at least rise. We rolled up our sleeping pads and sleeping bags and got ready. Breakfast consisted of either oatmeal or ramen. I chose the ramen. Harnesses on? Check. Crampons on? Check. Backpack? Headlamp? Check. Tuesday 12:15am  We were off. 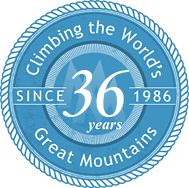 We had three rope teams, two with four climbers (three clients, one guide) and one with three climbers (one guide, two clients) that I was on. I remember only bits and pieces of the next six hours. There was Disappointment Cleaver with a ton of rocks and dirt. We topped out above the DC and took a rest break. Parkas on, the guides encouraged us to get some food and water down. They had previously suggested we put some snacks in our parka pockets and that turned out to be a great move  simply put your hand in your pocket and pull out a bar. It was great because you could focus on getting hydrated and caloried up rather than searching for food in your pack in the dark. After that, there were a ton of switchbacks. There were a couple of ladder bridges. Which order they came in? Hard to say. But I do remember that as we headed up the mountain, coming down the mountain was Jason (our crampon class instructor) and another guide. "Jason?" I shouted out. I couldn't believe my eyes. "Hey dog," he said. "Good trail up there." I had to laugh. Here's the guy who had been teaching our crampon class earlier that day  no wait  early the day before  coming down from the mountain at 2:30 in the morning after working to help clear the trail all night, and he still had a sense of humor. Pretty cool. At some point I realized there was another climbing group some ways behind us. From time to time I could hear the guide from that group pressure breathing. That was also when I realized there was a surprisingly large amount of downhill. I remember thinking  this can't be good! What goes down... must go up. Or is it, what goes up must come down? I was on the end of the last rope team and it was pretty quiet back there. The good news was, all I had to do was stay focused and put one boot in front of the other. Later, things got interesting. The route the guides had found was an old route, used earlier in the season. We headed around the mountain one way, then headed back the other way, across bumps in the snow called penitentes. They're like mini snow banks, and we stepped either over or on them in our crampons and plastic boots. The reason for this was that the guides had to take us around where the crevasse had caved in so we could get up past it. While they had found a route and had had a chance to clear quite a bit of it, they hadn't had time to clear about an hour's worth of trail across the penitentes. But our whole group stayed with it, hammering on until we reached high break. The climbing group that was behind us pushed on, and we would find them a little while later, just ahead of us. At the break, it was freezing. Cold wind, the kind of cold where five layers still doesn't keep you warm. The guides checked in with everyone, making sure we wanted to continue. I got some water down, got a few bites of food in and changed into warmer gloves. We pushed on, parkas on. Just as we were passing the group that had passed us, I heard their guide saying to them, "I'm sorry guys, but we're going to have to turn around." I couldn't believe it. Later I would find out they had started from Muir and that the extra difficulty and circuitousness of the penitentes route had taken its toll. We pushed on. As we climbed, we could see the sun coming up, and before we knew it, we were headed up one last very steep slope and then we were there. We took off our packs and climbed the last few hundred feet to the true summit. 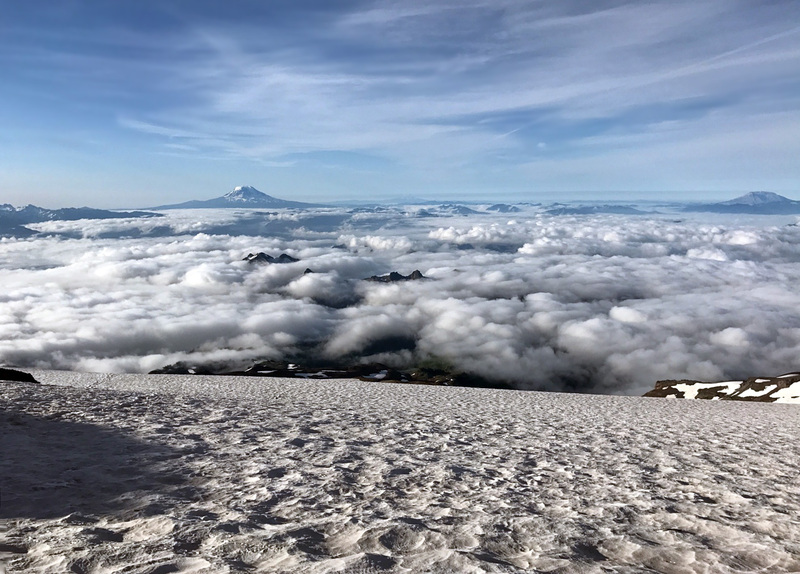 We had gone quite a ways around the mountain  instead of topping out at the summit crater and then crossing it, we were already above the summit crater. We took a bunch of photos  clear skies and smiles  and signed the summit log book. It was surprisingly warm up there and as the day wore on it would get even warmer. I wish I could say that before we knew it, we were back down, resting at IMG HQ, but the reality is that going down was as tough if not tougher than going up. 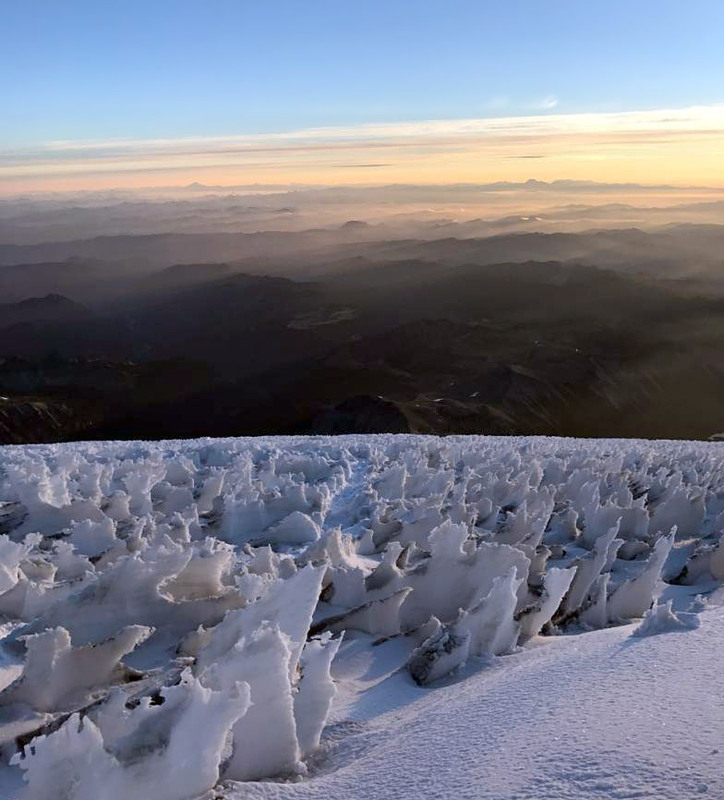 Back over the penitentes  except this time with warm, wet snow sticking to crampons. Knocking the snow off with every step. Crampons on rock. Low on water. Hot, hot sun. But finally we were back down at Ingraham Flats, and it was only 10:30am, maybe 10:45. We packed and headed down to Muir. And there sitting near the Weather Port was Phil Ershler, one of the founders of IMG. Phil is like your uncle. He's sitting there cracking jokes, all smiles, but then you know beneath the jokes there's a serious side. 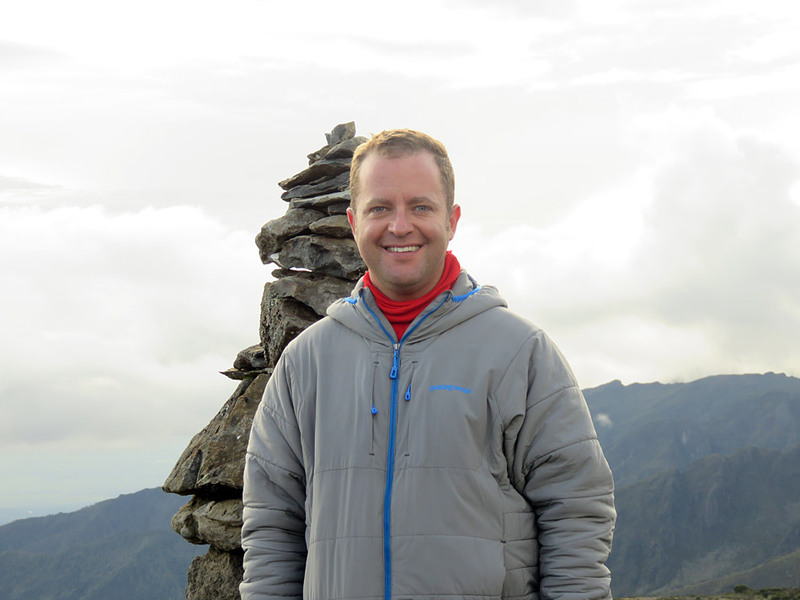 He's summited the tallest peaks in the world. He congratulated us on our successful summit, and then we headed down from Muir  a slog of a snowfield followed by dirt trail, and we were back at the parking lot around 4pm. I stopped to take a couple photos of the mountain on the way down and still couldn't believe we had made it to the top. What an amazing group, guides, and climb. Find the right tool, then figure out how much force to apply it with. If one tool isn't working, try another. Control the variables you can, don't worry about the ones you can't. The weather may clear, the route may open, those are not things you can control. You can control your preparation. You can control your food and hydration. You can control your personal approach toward the mountain and the climb. Have patience. I wanted to hustle down the mountain, boots, crampons and all, since I felt like I had a limited amount of time before I ran out of physical and mental fuel and with every minute it kept getting hotter. Not everyone is comfortable moving at that pace. Trying to rush them won't speed them up  it'll slow them down. Meet people at their speed, then try going a little faster, especially if you're connected to them on a rope! Time management. Back at the office, I realized that it is exhilarating to climb and bag a peak. But what it really does is give me more control over my perception of time. 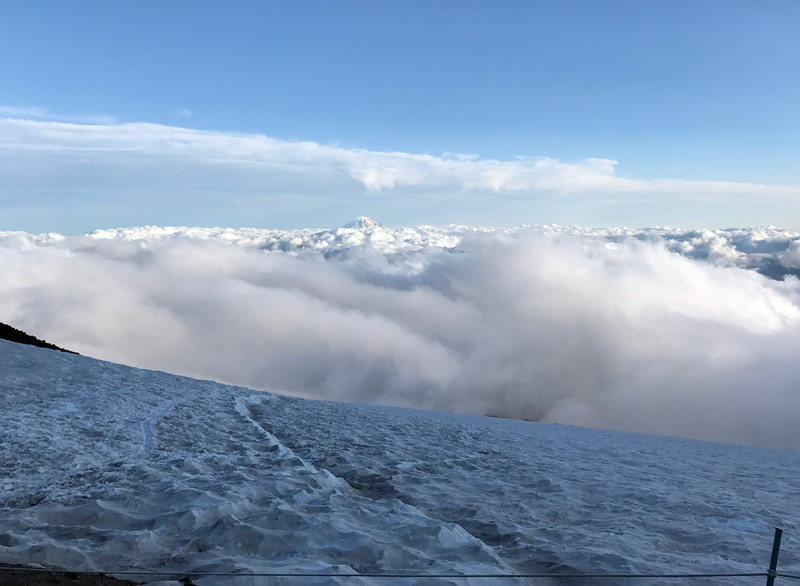 I find after summiting Rainier my mind is focused and I'm able to slow things down when I need to  and speed things up when I want to. Don't like the way that meeting is going? Slow it down. Need to pick up the pace? Go ahead. There's something about endurance activities that really changes one's perception of time. Up on the mountain, things move really slowly until they move really fast. That stays with you off the mountain. Food. I didn't need as much food as I brought with me. One of the guides later commented that I had one of the heaver food bags (you leave a lot of it at Ingraham Flats before you go to the summit). Think about the other summits you've done. How much do you eat? When it's cold, and things start to freeze, or they get crushed inside your pack, what's going to work, what won't? Fig newtons  too crumbly. Twix bars? Frozen solid, stuck to the wrapper. Peanut butter cracker sandwiches  good. Apples? Cut them into bite sizes pieces. Looking at a whole apple high up on a mountain? You realize you can only get a few bites down. And so on. I'd recommend more trail mix, fewer bars. Clothing. Recommended: A light colored, super lightweight long-sleeved shirt. I would even skip the short sleeve shirt and just pack a workout style long sleeve instead for when it gets really hot and you're on rope  long sleeves required. Cell coverage. 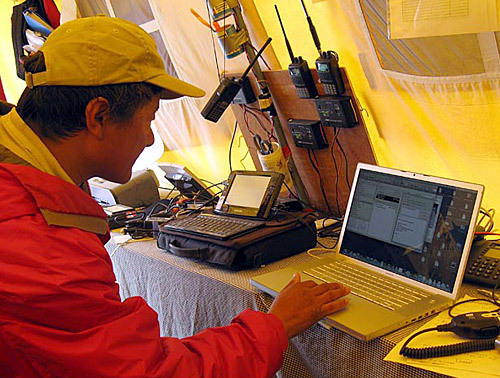 I got two bars at Camp Muir  with phone, text and Internet, on Verizon. At Ingraham Flats, by changing my phone settings (turn off LTE), I was able to get slow email and send text messages. Your call, of course, if you want to be totally offline. I found that being able to text back and forth with my wife and delete a few emails took my mind off things. This post is dedicated to my friends Clint Chase and Alison Howard. I was fortunate to meet Clint and Alison on our IMG Kilimanjaro climb, and summit with them in 2014. Clint passed away in 2015. Your expedition service surpassed all my expectations... and as such, I was successful in fulfilling a dream of 20 years. I will recommend your service to anyone interested. It was simply the best on the mountain.